If ever there was an opulently opossumish dish, this is it: It is humble, it is sublime. I have based my recipe on a few versions of it that Sue’s mom has provided. I feel justified in offering my own rendition because Sue’s mom has tinkered with the recipe plenty herself. This is a perfect supper for a cold wintry night! So comforting and warm! I encourage you to improvise your own version, too. 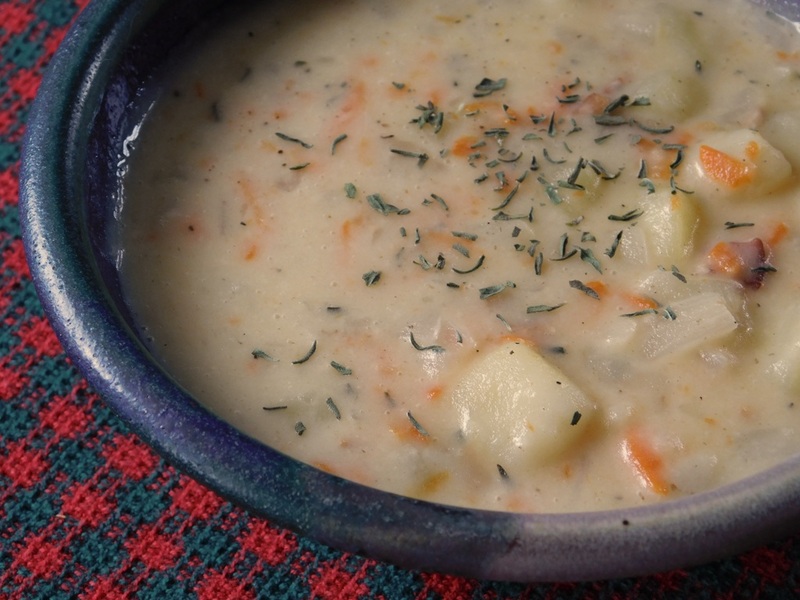 After my version of the recipe, I’ll provide two of the potato soup recipes just as I’ve received them from Mrs. Ferber, so you can get ideas for alterations, substitutions, and shortcuts. In a large, heavy-bottomed saucepan or soup pot, fry the bacon until crisp. Put it on a paper towel to drain and set aside. Pour off the grease into your grease jar. (You do save it, right? I mean, you’ll need it later when you want to cook kale!) Don’t clean the pan; leave the cooked bits of bacon and some grease at the bottom. Put the onion and carrot into the pot and sauté them in what’s left of the bacon grease. As moisture comes out of the onions, scrape the bottom of the pan to liberate the bacon goodies. You might add a little water to help the process. 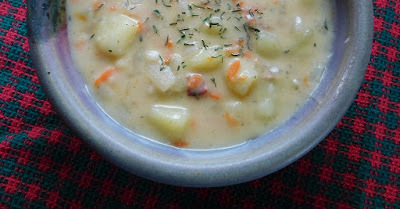 When that’s accomplished, add the potatoes, salt, and pepper, and cover with water or stock. Cook on medium, covered, until the potatoes are done. While the potatoes are cooking, crumble up the bacon—it will be a garnish. This is the time to make the cornstarch-and-water slurry if you haven’t already. Also, get out the saltines (or Chicken in a Biskit crackers; both are traditional), pieces of cheese or summer sausage, pickles, and whatever else you’ll be having. Set the table. Get the drinks ready. Once the potatoes are cooked, stir in the cornstarch slurry and cook to get it really pretty thick; then stir in some butter, and thin it out with milk to get the consistency to your liking. Make sure it’s heated through, stir in any parsley or other herbs you want, and then serve. Garnish with the crumbled bacon. Peel and dice about 2 potatoes. Chop the onion. Add carrot, salt, pepper—cook until done in water or chicken stock. Thicken with cornstarch—get it really thick—then add milk to get consistency right. Add a hunk of margarine. Garnish with crumbled bacon; serve with saltine crackers.
. . . And now, a bonus related recipe from notes I made during an Ohio visit during Christmas 2013: it’s very, very easy to make, though the sodium is probably frightful. Still, when you’re both disabled, can’t drive anymore, it’s cold out, and you’re eating out of the cupboard, this hits the spot! It’s probably from the back of a scalloped potatoes box. In a saucepan big enough to hold everything, sauté the onion in the margarine. Then add the rest of the stuff and simmer, covered, for 20–25 minutes. Thanks for the recipes. The blacksmith doesn’t like milk, so I must try one of these. Well . . . milk is a part of all these. Or maybe you're saying this soup would be a way to get milk into him when he doesn't like to DRINK milk? . . . Anyway, on the subject of milk, recently I've discovered Kefir--which is sort of like a yogurt smoothie. Because it's fermented, there's very little lactose left in it. And the probiotics are good for your digestion. It's a bit of an acquired taste. I can recommend the pomegranate, mango, and strawberry flavors. Opulent life in Central Missouri—Attitude, places, food, mood, and other doin’s here in the heartland. Join the Op Op on Facebook! Why? So you can easily comment on posts! Also, you can yak with Julie and other Op Op readers. Plus, you'll get notification and links to new Op Op posts automatically on your FB page. Ain't technology grand? I was born and grew up in Columbia, Missouri, moved out of state for grad school and jobs, then came back to Missouri . . . and somehow I’m still here. My sweetie and I bought my grandma’s house in Jefferson City in 2001, and all kinds of things have resulted from that—both frustrations and glory. Oh, by the way, I’m a freelance book editor and publishing consultant, but this blog is my chance to be anything but an editor! Apologies in advance, but I’m too poor to hire an editor for my own writing, and I don’t have the time to devote to editorial polish here. My interests are wide, but there are some things that can hold my attention for especially long periods of time. For instance, I love natural history—plants, fungi, bugs, aquatic things, birds, you name it—and hiking is what truly brings me home. I also love good food. Most recently, I’ve been teaching myself how to cook German dishes, since that’s my heritage and the older generation is slipping away, but I love Indian cuisine as well and can also make an awesome Mexican fiesta. Mediterranean? Yes. Vegetarian? Often. Sushi? Check. Grandma’s vintage Maytag Dutch Oven gas range came with the house, and the whole kitchen has excellent mojo. I should also mention that I have a tendency to be depressed; I created this blog in part to remind myself of all the things there are here in Central Missouri, in the Ozarks, and all around me, to be happy and enthusiastic about. Of course it’s not all sunshine and rainbows, but you really can find coolness and authenticity in unlikely places. And that’s what I’m trying to highlight here. If you want to contact me, simply leave a comment on a post and I’ll see that you have done so and respond. Maybe I’m overcautious at this point, but well, you know—I’m trying to avoid spammers and stalkers and what-not. Finally, thank you for reading my blog. Leave me a comment to let me know you’ve stopped by! I hope you enjoy your little peek into my day-to-day observations and reflections. Central UCC, Jefferson City, Mo. Global Foods Market, Kirkwood, Mo. Kitchen Retro: Kitsch & Retro! In recent years, I've been using Blogspot's "comments moderation" feature: All comments come to me first as an e-mail, and then I approve them, before they are posted. I don't like this at all, but it seems the only way to deal with spam. Maybe someday Blogger will develop a spam filter that's smart enough to screen out certain words (such as "viagra" or "cialis"). Sorry that comments won't appear instantly. I do see them, and if they're genuine posts and not spam or other ham-handed attempts at advertising, they will get posted. Have faith! And thank you in advance for your comments!